Clustering ± stemless rattan with a decumbent or short erect stem not exceeding 1 m tall; stem without sheaths c. 20 mm diam., with sheaths to 50 mm diam., frequently less, internodes short, c. 2 cm long. Sheaths dull green with abundant mid to dark brown indumentum and armed with upward-pointing or horizontal spines from 3-30 mm long, those at the base of the petiole generally upward-pointing and much longer; knee absent. 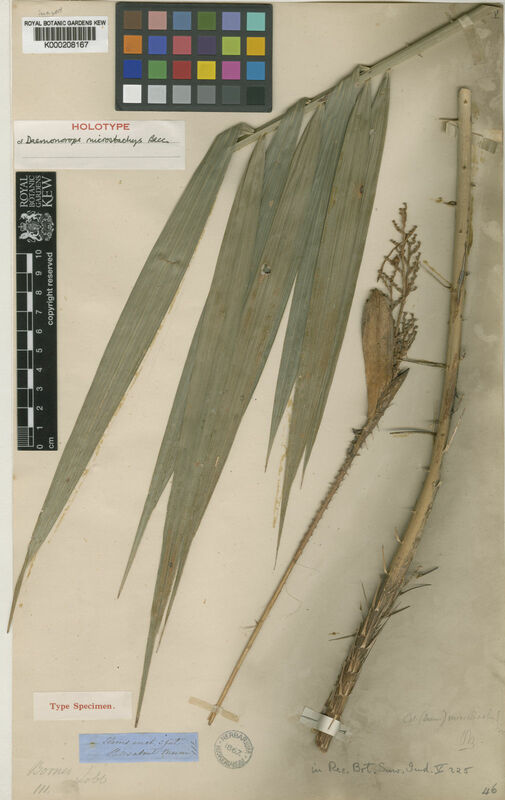 Leaf ecirrate to 2 m long, rarely more, usually much less; petiole to 35 cm, armed with abundant long horizontal spines, scattered or in whorls, to 3 cm; leaflets to 35 on each side of the rachis, regularly arranged, the longest to 27 × 2.5 cm, usually less. Inflorescences usually borne on a slender peduncle arching out of the crown, to 20 cm long; partial inflorescences usually ± congested into a head at the end of the peduncle; female rachillae rusty tomentose, to 4 cm, male similar, to c. 2 cm. Mature fruit globose or top-shaped, to 10 × 8 mm and covered in 15-16 vertical rows of green turning straw-coloured or brown scales. Seed globose, c. 7 mm diam. ; endosperm deeply ruminate. Seedling leaf not known. (Fig. 16). Found scattered throughout Brunei. Elsewhere throughout Borneo. Endemic.